Area of Czech Canada is found in south Bohemia on historic border of Czech and morava and around border with Austria. 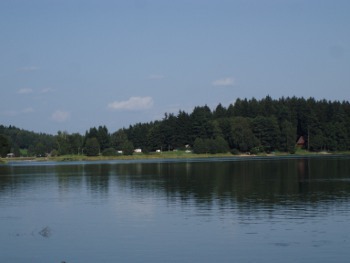 There is Jindřichohradecká pahorkatina in North-West part of Czech Canada, which continues to Trebonska panev in South-West. The bigest part of Czech Canada is covered by strongly forrested Novobystricka vrchovina, which continues to Ceskomoravska vrchovina in North. Espetialy West part of this area (Strmilov lies here) is very ritch on pounds. They are used not only for fish-breeding, but also as nesting for water birds. Some pounds are used for swimming at summer. The most popular from them are Komorník, Ratmírovský rybník a Zvůle(very close to Strmilov). Visitors can find here not only pounds, but also valleys with rivers, deep forrests and many cultural monuments. There are castles and historical towns Telč, Slavonice a Jindřichův Hradec near of Strmilov.